The news that veteran goalkeeper Edwin van der Sar is to retire at the end of this season did not come as a big surprise. Although his performances for Manchester United this season have been up there with his best (he has conceded just 30 goals in 32 Premier League appearances and just 3 goals in 9 Champions League games), at the grand old age of 40, he has enjoyed a far longer career than many players dream of. Since the announcement, speculation has been rife as to who will replace van der Sar as Sir Alex Ferguson’s first-choice goalkeeper. So, let’s assesses the likely contenders. Back in October 2010, when it was reported that Manchester United’s chief scout Martin Ferguson watched McGregor produce an outstanding display in Scotland’s 3-2 defeat against Spain, it looked as though Sir Alex Ferguson was lining up a bid for the Ibrox stopper. Speculation has cooled in recent months, but the 29-year-old has been in superb form for the Glasgow giants this season and would probably be available for less than £8million. "Fancy playing for us next year?" The 25-year-old captain of Schalke 04 has been touted as a prospective Manchester United goalkeeper since impressing during last summer’s World Cup. On 20 April 2011, Neuer announced that he would not be extending his Schalke contract, which is set to expire at the end of the 2011–2012 season. Bayern Munich is reported to be his most likely destination, but the young star may see Manchester United as being more likely to fulfil his Champions League aspirations. A product of Atlético Madrid’s youth system, this Spanish wonder kid might not have the experience of other goalkeepers mentioned in this list, but the 20-year-old has a growing reputation as one of the best shot stoppers in the world, and is now considered to be the long-term replacement for Spain’s current number 1, Iker Casillas. Whether Sir Alex will risk splashing the cash on a relatively unproven player remains to be seen. Reina is a consistent performer and, after nearly seven years at Liverpool, may feel it is time for a new challenge. The 24-year-old has impressed in the Championship this season with Leeds United. With just one year remaining on his contract, and Leeds United resigned to another season outside the Premier League, Sir Alex may see it as an opportunity to get an highly regarded goalkeeper for a reasonable price. His father, Peter, is widely considered to be Manchester United’s greatest ever goalkeeper. Will his son follow in his footsteps? When Adler negotiated his latest deal at Bayer Leverkusen he insisted he would only accept their contract of new terms if it made provision for his lifelong ambition to play for Manchester United. The controversial release clause was duly written into the German international’s contract. The asking price for the 26-year-old will be high, but the prospect of a hassle-free release from Adler’s current club may appeal to the United manager, who sent goalkeeper coach Eric Steele to Germany in March for a closer inspection of the shot-stopper. Will Sir Alex make an approach for Lloris? Olympique Lyonnais, having guaranteed Champions League football for next season, would be reluctant to allow Lloris to leave. Will Sir Alex tempt them with a bid in the summer? Having already followed in the footsteps of van der Sar by succeeding him as goalkeeper for Ajax and the Dutch team, it is not unthinkable that the 6 foot 6” shot stopper could also replace him at Old Trafford. 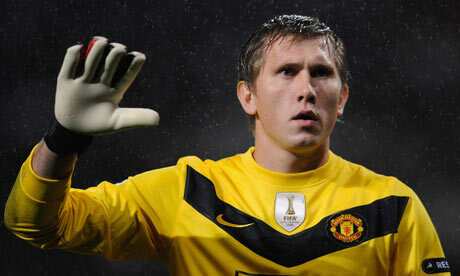 Will Kuszczak be given the number 1 spot? The Polish international has been a perennial understudy during his five years at the Manchester club. Therefore, with the departure of the team’s current number 1, it could be expected that Kuszczak will make the step up next season. Signed by Manchester United in November 2010, Lindegaard cannot be overlooked when it comes to considering who will replace van der Sar as the team’s first-choice goalkeeper. The 27-year-old, who was a boyhood United fan, has played just two games for the club (both in the FA Cup, in victories against Southampton and Crawley Town) and is more likely to be viewed as a back-up goalkeeper for next season. Amos: one for the future, perhaps? After the signing of Lindegaard, the 20-year-old Amos went on loan to Oldham Athletic from January until the end of the season, to gain match experience. Before then, the England youth international played in United’s final Champions League group match against Valencia at Old Trafford, where he failed to prevent the first goal United had conceded in the Champions League that season. As he is behind Lindegaard in the current pecking order, it is highly unlikely that Amos will become Sir Alex’s first-choice goalkeeper for the 2011-2012 season. What? Edwin van der Sar will be replaced by… Edwin van der Sar? Well, it is possible that he may be persuaded to stay on if a suitable successor cannot be found. Given the calibre of goalkeepers mentioned above, however, that scenario seems unlikely. When Peter Schmeichel left in 1999, Sir Alex utilised a series of relatively ineffective goalkeepers, including Mark Bosnich, Fabien Barthez, Massimo Taibi, Raimond van der Gouw, Andy Goram and Roy Carroll. The United manager has vowed not to make the same mistakes in replacing van der Sar. In January of this year, he said: “We hope we’re better organised this time.” In other words, a big-name, experienced goalkeeper will be sought. David de Gea and Stekelenburg would both be exciting purchases, however, the Dutchman has much more experience in big matches (he played for the Netherlands at the 2010 World Cup, where they reached the final). Presumably, his 40-year-old compatriot will have given a glowing reference of his ability to Sir Alex. If so, considering van der Sar’s legendary status, that would be a highly significant commendation. This entry was posted in Football and tagged Allan McGregor, Anders Lindegaard, Ben Amos, David de Gea, Edwin van der Sar, Goalkeeper, Hugo Lloris, José Manuel Reina, Kasper Schmeichel, Maarten Stekelenburg, Manchester United, Manuel Neuer, René Adler, Sir Alex Ferguson, Tomasz Kuszczak. Bookmark the permalink. Also a good shopping list for other clubs, like Spurs! it will clearly be stekelenburg. as said they will not go for anyone who is not world class, which rules out half this list. reina would cost too much, neuer wants bayern, lloris is at a great club already, de gea is too young. if it wasn’t for the talk about the others everyone would be assuming they’d go for stekelenburg. it just makes sense; ajax are imploding right now and hemorreaging great players (suarez). ferguson plans these things years in advance and the public courting of others only serves to keep the price of his true target at a competetive level. he’s learnt his lesson; he’s more likely to compromise elsewhere than between the sticks. The goalkeeper I mentioned first in the list? I’ll be very surprised if Sir Alex goes for a decent ‘keeper rather than a world class one. Manuel Neuer is my best goalkeeper, so i will be very glad if to see him on a red shirt !! As to me, more has to be done so that Manuel neuer will be the only United’s amusing goal keeper who can replace Vander sar. That looks pretty unlikely now. My money is still on Stekelenburg.